Margo Dunworth, Clinical Maternity Manager at the Regional Maternity Hospital, receiving a cheque for €2,000 from Caitlin Fahey, her father Roderick Fahey and her mother Catriona Fahey representing Ryans Cleaning, Thurles. Every year the team at Ryans Cleaning choose a charity to raise funds for and in 2017 the Limerick Neonatal Unit Fund was selected. The Limerick Neonatal Unit at the Regional Maternity Hospital has 19 cots providing Intensive Neonatal Care, High Dependency Care and Special Care for approximately 1,000 babies per year. This charity is very close to the hearts of all at Ryans Cleaning as they have witnessed the great work they do first-hand. 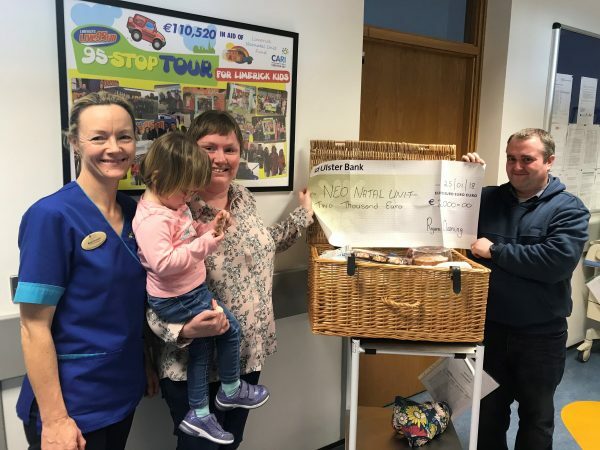 Margo Dunworth, Clinical Maternity Manager at the Regional Maternity Hospital, receiving a cheque for €2,000 from Caitlin Fahey, her father Roderick Fahey and her mother Catriona Fahey representing Ryans Cleaning, Thurles. On the 18th June 2015, Catriona Fahey, Senior Accountant at Ryans Cleaning went into pre-term labour at just 30 weeks, needless to say, this was a really worrying time for Catriona, her family and colleagues. On delivery, baby Caitlin weighing just 3 pounds 2 ounces was immediately rushed to Neonatal Intensive Care at Regional Maternity Hospital. The team at the Limerick Neonatal Unit worked tirelessly on little Caitlin to help her tiny lungs and premature body to strengthen and develop in the hope of giving her every chance of survival. It is without a doubt that, the care and attention Caitlin received was world class. The nurturing that little Caitlin received from everyone who nursed her was truly remarkable. Thankfully she responded with courage and determination and after 58 days in the Limerick Neonatal Unit Caitlin was discharged and went home with her mum and dad and hasn’t looked back since. In honour of this gorgeous little girl and the support she received in those early weeks of life, the team at Ryans Cleaning ran various fundraising campaigns throughout 2017 and raised a total of €2,000 for the Limerick Neonatal Unit Fund.